The last time I visited Yad Vashem was with the Prime Minister of Canada Stephen Harper, a great friend of Israel and the Jewish people. We went through the exhibition rooms which present heartbreaking documentation of the destruction of European Jewry. Today in my office, I met Felah, an 82 year old Holocaust survivor. It was important to her to tell me on this day of all days how her memories as a child of seven who was forced to leave her two year old sister behind to die, how those memories are always with her. She told me, “I don’t remember what happened yesterday or the day before that, but as is the way of memories from that age, I remember the tearing, sad eyes of my two year old sister”. I met Shalom, an 89 year old Holocaust survivor, who told me how he left home at 18. He was 13 and the conditions in the ghetto were deteriorating so he, a young boy, decided to leave. He said, “Mother objected and wailed and Father was quiet. He stood and put his hand on my heard and blessed me and told me to save myself”. All the exhibition rooms here are filled with such heartbreaking stories. When we left Yad Vashem, I told the Canadian Prime Minister that the primary duty of the Prime Minister of Israel is to ensure that there will be no more memorial sites like this, that there will never be another Holocaust. I have said many times in this place that we must identify an existential threat in time and take action in time. Tonight, on the eve of Holocaust Remembrance Day, I ask myself: why, in the years preceding the Holocaust, did the overwhelming majority of world leaders and Jewish leaders fail to detect the danger in time? In retrospect, all the warning signs were there: the strengthening of the Nazi regime year after year; the horrific anti-Semitic propaganda which grew stronger with each passing month; and the murderous attacks on Jews which began as a trickle and transformed into a huge wave. In retrospect, there is a direct line connecting the racial laws and the gas chambers. Very few world leaders understood the enormity of the threat to humanity posed by Nazism. Churchill was one of them. Few among our leaders, primarily Jabotinsky, warned against the imminent destruction facing our nation, but they were widely criticized and their warnings were disregarded, and they were treated as merchants of doom and war mongers. So I ask: How is it possible that so many people failed to understand the reality? The bitter and tragic truth is this: it is not that they did not see it. They did not want to see it. And why did they choose not to see the truth? Because they did not want to face the consequences of that truth. During the 1930’s, when the Nazis were gaining momentum, the influence of the trauma of the First World War was still fresh. Twenty years earlier, the people of the West experienced a terrible trench war, a war which claimed the lives of 16 million people. Therefore, the leaders of the West operated on the basis of one axiom: avoid another confrontation at any cost, and thus they laid the foundation for the most terrible war in human history. This axiom of avoiding conflict at any cost, this axiom was adopted not only by the leaders. The people themselves, primarily the educated ones, shared it too. In 1933, for example, the year Hitler rose to power, there was a meeting of the Oxford University student organization – an institute from which generations of British leaders had emerged. Following a heated debate, the students voted for a resolution stating that they “would under no circumstances fight for their King and Country”. This resolution passed by an overwhelming majority only ten days after Hitler entered the Chancellery of Germany. And believe me: that message reverberated in Berlin. This example illustrates the West’s feeble attitude vis-à-vis the rise of Nazism. When you refuse to accept reality as it is, you can deny it. And this is precisely what the leaders of the West did. They dismissed the murderous Nazi rhetoric as internal German politics; they downplayed the seriousness of the danger of the military build-up of the Nazis, claiming that it was the result of the natural will of a proud nation, that it should be taken into consideration, that it should be accepted. The reality was clear, but it was cloaked in a bubble of illusions. This bubble was burst by the stealth attack by the Nazis on Europe. And the price of the illusion and desire was very heavy because by the time the leaders of the West finally acted, their people paid a terrible price. World War II claimed the lives not of 16 million people, the unimaginable number of victims during World War I, but of 60 million, including one third of our people, who were butchered by the Nazi beast. Has the world learned from the mistakes of the past? Today, we are again facing clear facts and a tangible threat. Iran is calling for our destruction. It is developing nuclear weapons. This is the reason it is building underground bunkers for the enrichment of uranium. This is the reason it is establishing a plutonium-producing heavy water facility. This is the reason it continues to develop inter-continental ballistic missiles that can carry nuclear warheads to threaten the entire world. Today, just like then, there are those who dismiss Iran’s extreme rhetoric as one that serves domestic purposes. Today, just like then, there are those who view Iran’s nuclear ambitions as the result of the natural will of a proud nation – a will that should be accepted. And just like then, those who make such claims are deluding themselves. They are making an historic mistake. We are currently in the midst of fateful talks between Iran and the world powers. This time too, the truth is evident to all: Iran is seeking an agreement that will lift the sanctions and leave it as a nuclear threshold state, in other words, the capability to manufacture nuclear weapons within several months at most. Iran wants a deal that will eliminate the sanctions and leave their nuclear capabilities intact. Such a deal, which will enable Iran to be a nuclear threshold state, will bring the entire world to the threshold of an abyss. I hope that the lessons of the past will be learned and that the desire to avoid confrontation at any cost will not lead to a deal that will exact a much heavier price in the future. I call on the leaders of the world powers to insist on a full dismantling of Iran’s capability to manufacture nuclear weapons, and to persist until this goal is achieved. In any event, the people of Israel are strong. When faced with an existential threat, the situation of our people today is entirely different than it was during the Holocaust. Today, we have a sovereign Jewish state. As Prime Minister of Israel, I do not hesitate to speak the truth to the world, even when faced with so many blind eyes and deaf ears. It is not only my right, it is my duty. It is a duty I am mindful of at all times, but particularly on this day, in this place. Unlike our situation during the Holocaust, when we were like leaves on the wind, defenseless, now we have great power to defend ourselves, and it is ready for any mission. This power rests on the courage and ingenuity of the soldiers of the IDF and our security forces. It is this power that enabled us, against all odds, to build the State of Israel. Look at the remarkable achievements we have made in our 66 years of independence. All of us together – scientists, writers, teachers, doctors, entrepreneurs, employees, artists, farmers – the entire people of Israel, each one in their own field – together we have built a glorious state. The spirit of the people of Israel is supreme, our accomplishments tremendous. 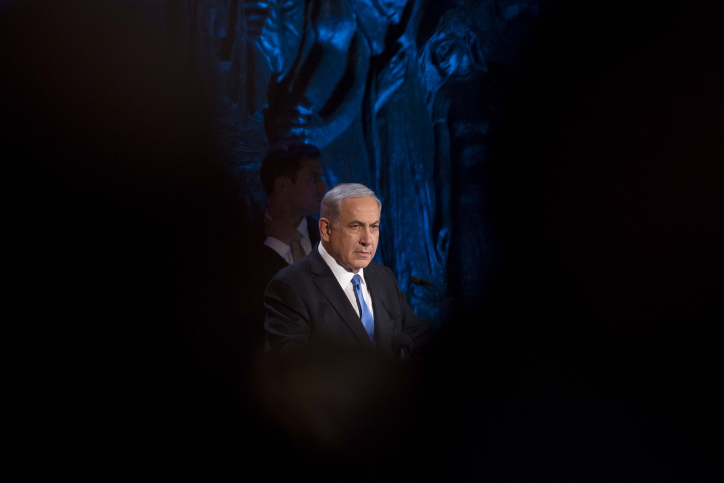 Seven decades after the destruction of the Holocaust, the State of Israel is a global wonder. On this day, on behalf of the Jewish people, I say to all those who sought to destroy us, to all those who still seek to destroy us: you have failed and you will fail. The State of Israel is stronger than ever. It is a state that seeks peace with all its neighbors – a state with a will of iron to ensure the future of its people.